From left, Leo Flynn, Scott Duffey, Logan Urtubees, Culton McBrayer, Raul Perez, Daniel Perez, Tim McDaniel, Tyler Ferguson, Zach Keaton, Phil Newman and Corey Waters of Southern Spear at McMurdo Station in Antarctica. The local company is the shell contractor to rebuild the largest Antarctic station. (Contributed photo provided by Southern Spear). The first trip of a Chattanooga company's yearslong job to rebuild the largest station on the world's coldest continent featured whale and penguin sightings, a delayed shipment and 60-hour work weeks for a month and a half. The job, though, went largely according to plan as workers with Southern Spear Ironworks finished much of the structure for the main hub of America's scientific base in Antarctica. Now, employees are back in Chattanooga, continuing to work on other jobs and looking for help as the company continues its rapid expansion. "You see some of these most-watched shows on TV, and they're driving trucks on ice," company founder and Chief Executive Officer Sean Compton said. "Well, we're building a city on ice." Want to work with Southern Spear? The U.S. government is rebuilding McMurdo Station — its logistical hub for scientific research in Antarctica. The station hosts a wide range of scientific activities and is the biggest community on the continent, housing about 1,100 people during the peak summer months, which is during the winter in the U.S. The station was built in the 1950s and expanded to more than 100 structures in the following decades. Now, the government is working to create a new, state-of-the-art facility to streamline operations and add efficiency and space. The 100-plus structures will be consolidated to six primary buildings, with about 18 or 19 structures that encompass more combined square feet, and will ensure the long-term sustainability of the U.S. Antarctic program, according to information from the National Science Foundation. Southern Spear won the contract as the project's shell contractor and will build the outer structure of the facilities. It involves 14 to 18 phases, seven to 10 years of work and spending months at a time in Antarctica. Compton started the company from his home about two years ago after working for a corporate construction company. He moved and got married to Lizzette Compton, who lived in the area and now also works for Southern Spear. The company now has about 50 employees and is expanding. A small crew of Southern Spear employees took the first trip to begin phase one, returning Friday after having worked 10-hour shifts, six days a week to build the outer shell of the station's new hub for about a month and a half. The team flew in to Antarctica's Phoenix Airfield on Jan. 30 Chattanooga time and Janu. 31 in Antarctica — the continent is 18 hours ahead of Chattanooga. The team stayed in dormitory-style quads, with each having a roommate and a bathroom that attached to another room. The food, they said, was surprisingly good, and they stayed in touch with friends and family. "As far as working, I've always worked out of town. I've done that my whole career," director of field operations Phil Newman said. "I got to talk to my kids and my wife on a daily basis." The challenge was adjusting to the time change and figuring out the best times to call his wife and three children. The team included laborers, equipment operators, welders and others in a 14-man crew. Most stayed for the entirety of the trip, which ended with a return flight last Friday out of Christchurch, New Zealand, just an hour before the shootings at two mosques in the city killed 50. The return brought major adjustments. There was the jet lag, traveling back in time by nearly a day, and adjusting to night time — Antarctica had 24 hours of daylight for the majority of the trip. "It was a little rough. It didn't hit me near as much going as it did coming back," company chief operating officer Leo Flynn said. It took him the better part of a week to readjust upon his return. Compton planned to go but logistics and project details have fluctuated throughout the process. The company founder felt he needed to stay behind to work from an area that provided the network reliability offered in Chattanooga to share large files and stay in communication with clients and contractors while working on other jobs. The trip began with orientation and then waiting. A supply shipment with all of the tools and materials for the job was delayed through the first week. The temperatures and frozen water make shipping to the continent one of the hardest aspects of the job. The station is only accessible for the warmest part of the year, so equipment is all sent in one huge shipment to give the workers the materials they need before Antarctica is inaccessible. The warmest temperatures in the midst of Antarctica's summer were around freezing, but dipped to minus-20 degrees for parts of the trip. After a few days, the supplies arrived and the men began working. "Finally getting to start and knowing we were working on this big project in Antarctica was a big highlight," Flynn said. The team enjoyed their free time, visiting remnants of an old plane crash. They saw wildlife native to the area and met new people working on scientific research at the site. The cold and wind presented challenges, but nothing the crew wasn't prepared for. They had partnered with Carhartt, the durable workwear company, to wear the company's cold weather gear. The frozen tundra also makes pouring concrete impossible, so workers used a crane, fine-grain sand and footers to place a foundation. 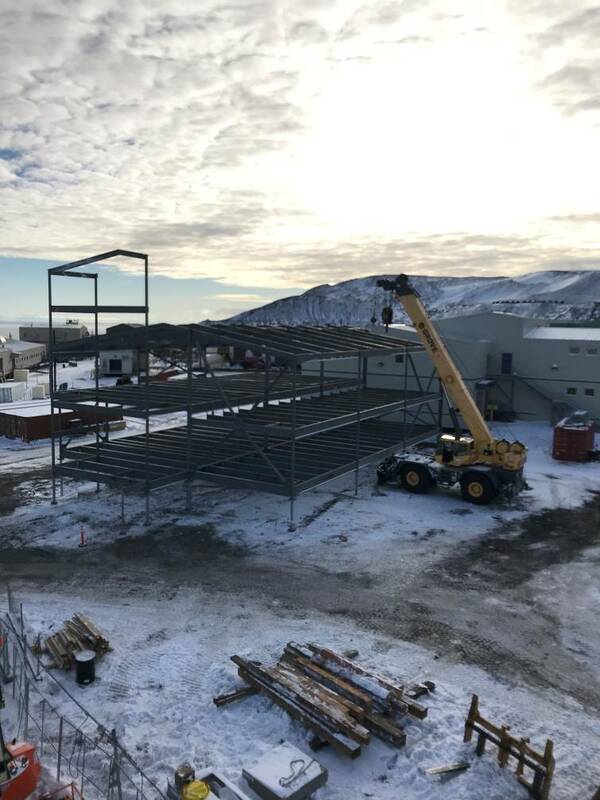 In the month-plus of work, Southern Spear completed the steel structure of the main facility. Compton plans to take a larger crew of closer to 30 back to continue work in October. They'll finish phase one and begin working on phase two — a 70,000-square-foot vehicle equipment operation center that Compton called "basically, a giant Jiffy Lube for huge vehicles." The crew hopes to be back before Christmas but plans to make a couple of long trips annually throughout the project. Southern Spear is looking for Chattanooga area contractors to work on the contract for jobs including, but not limited to, metal roofing, metal siding, ironwork and carpentry. They will hire individual contracts as well as companies. The company is also hiring for positions in its shop. For more details, email jobs@thesouthernspear.com.